Once upon a time there was a mom. Her only child was getting married and she wanted an extra special gift to mark the occasion. A gift that they might always remember. She was not a rich woman and could not shower them with money. So she thought and she thought and she thought. And then… inspiration! She took out her worn crochet hook and a few skeins of yarn. She thought about her son and all the crazy, beautiful, wonderful moments that had brought them to this one. And she crocheted and crocheted. And when she was done, she had an afghan and she called it the ‘Happily Ever Afghan’.I am so excited to present the Happily Ever Afghan on the blog as a free pattern! As I was designing this afghan, I knew I wanted to tell this pattern’s story. I also knew that there were some details that would be best shared over a series of posts and not condensed to fit into the constraints of a traditional pattern. And besides…The Happily Ever Afghan is all about love…and love should be free, right? This afghan will be shared as a series of 4 (or possibly 5) posts. This first post is all about the design process–how to plan an afghan. Maybe it will inspire you to design your own project or maybe it will help you plan out a project from an inspirational pattern you’ve found online. Or maybe you just want to make THIS afghan. When saw these fun drapery panels on the Bed, Bath and Beyond gift registry, I fell in love. They remind me of everything that is Matt and Katie…fun, eclectic and vibrant. They have a bohemian feel that I love. The pattern in the fabric reminded me of a crochet doily and I wondered if I could make an afghan square that would give the same feel. I purchased the drapery panels and then took one out of the packaging and went yarn shopping! When I say I went yarn shopping, I wasn’t kidding. I literally took the drapery panel and made my rounds around town. It turns out there are a lot of colors in the drapery panel and matching the colors was harder than I thought it would be. I started off by just trying to find the colors that were in the panel. So I purchased about 10 skeins of yarn from various manufacturers. Then I took them home and looked at them in different lighting against the drapery panel. Ok, let’s be honest, I took the yarn home and was completely overwhelmed and not quite sure how I was going to pick the perfect colors or how in the world I was going to craft an afghan that looked nice! Deep breaths! My first problem was that I had WAY too much yarn..and let’s face it, I’m a yarn hoarder…a yarn lover…so I really loved every last skein and for the most part, they all would have matched with the various colors in the print. But there were way too many colors and I wanted some cohesiveness in the project. When I crochet a project, I really try to use the same brand and type of yarn. This way the yarn throughout the project is consistent. The weight is the same. If there is a sheen to the yarn .. it is the same. Worsted weight yarn can be slightly different weights between brands and it will work up to a different gauge. I’ve even noticed differences in the texture of the yarn. My hands down favorite yarn to crochet with is Vanna’s Choice by Lion Brand. (And they don’t sponsor my posts–at least not yet….so you know I’m being real with you!) I get consistently good results with this yarn and I just love it. So this afghan is almost all Vanna’s Choice yarn. Read on… to learn about the exception and how I came to that decision! I really couldn’t decide what to do! So many colors! And Vanna’s Choice had many of them, but not the absolute best combination. What to do, what to do! I decided picking a neutral would be a good first step. I went with a neutral Linen in Vanna’s Choice for my main color. I felt like it had the feel of white or cream, but wouldn’t show any dirt or wear and tear. I also felt it had a “cool” look, much like the drapery panel as compared to a “warm” look that a light beige might have given. By picking the neutral first, I felt like at last I made ONE decision! But then… all those wonderful color skeins! What to do next!! All the skeins picked up one color or another in the drapery panel. I decided it was best to match the “feel” of the drapery panel and not necessarily reflect all the colors in it. Ultimately I put all the skeins in a pile and picked out the 4 best colors that went with my neutral and looked best with each other–taking the drapery panel out of the equation. I did this by process of elimination, pulling out the skeins that stood out too much. And since there were a lot of dark or bright colors in the panel, I knew that a pink was one that I needed to make the afghan pop. I also fell in love with the teal, so that had to stay. I loved the turquoise color in the panel and there was a Vanna’s Choice shade that matched perfectly. But with the other colors it looked too bright. So sometimes you have to say goodbye to a yarn you love because it just won’t work in that particular project. Ultimately I went with sea blue in Hobby Lobby’s “I Love This Yarn”. I made sure the weight and thickness felt close to the other skeins, which are all Vanna’s Choice yarns. Here’s where I had to spend some time and do some math. Afghan sizes are very forgiving. As long as you are not trying to fit a specific piece of furniture (like a bed), you can make the afghan any size that feels right to you. First, I designed a square. I wanted a look that mimicked the lace doily look of the drapery panel. However, I wanted this to be an afghan with some substance, so I did not want a square that was too lace like. I found some inspiration photos and designed my own block. I am so pleased with my final result. It has some features of the inspiration photos, but is ultimately unique in it’s construction and detail. Next, I tried several color combinations until I found 6 combinations of color that I liked. My overall plan was an afghan that was 6 blocks wide by 7 blocks long. I knew I wanted to try a braided join, which is something I hadn’t done before–so I knew that part was up in the air. I also wanted a great border, but I hadn’t found one I liked. So I wanted to be sure to buy plenty of yarn for the project with not a lot of leftover waste. Next, I unraveled a block and measured the yardage of each color yarn. I cheated a bit. I unraveled the entire “color” section of a block, measured that and then multiplied by 7. My logic was that I had 7 blocks of each type and that I would use roughly the same amount of each color yarn. My goal was to buy enough yarn and this told me that I needed more than 1 skein of each color with plenty left over on the 2nd skein. I did pretty well on this. 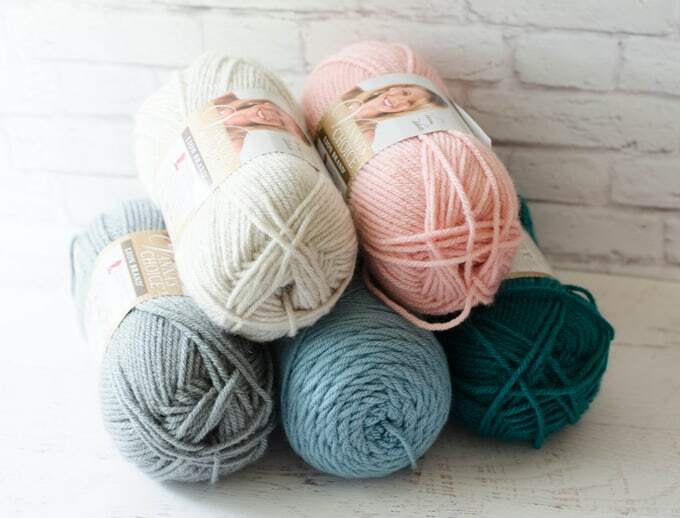 I bought 2 of each of Vanna’s Choice yarn in pink, silver grey and peacock. I also bought 1 skein of Sea Blue Hobby Lobby “I Love This Yarn”. I used about 4 oz or so of each color. For the main color, I crocheted a sample with included some of the braided join. Then I unraveled all of this to determine the main color per block and then multiplied it out by 42 blocks. To this I added extra for borders. And then I added 10% on top of that to allow for errors in my calculation. This resulted in quite a few skeins and unfortunately, my local store didn’t have enough in the same dye lot. (If you want to learn more about why dye lot is important, read here.) So I ordered that online. I purchased 10 skeins and had about 1.5 leftover. I’m happy about that because I had plenty for my project in a matching dye lot. If you want to make this afghan in the same colors, buy 35 ounces of yarn in the main color. The afghan ended up approximately 52 inches by 60 inches, which was roughly what I envisioned. It is the perfect size to snuggle under on the couch or recliner while watching TV. If you want your afghan bigger or to fit a specific size, just add more rows and calculate for additional blocks. 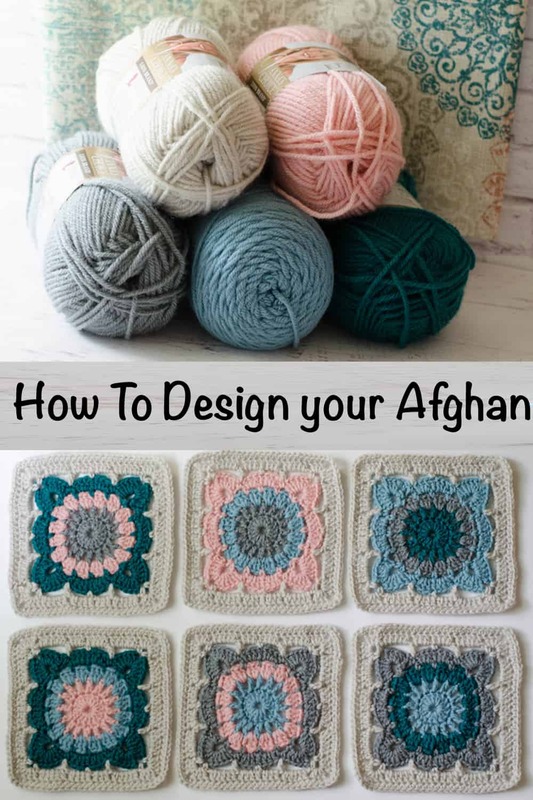 If you were wondering how to plan an afghan–hopefully now you know! 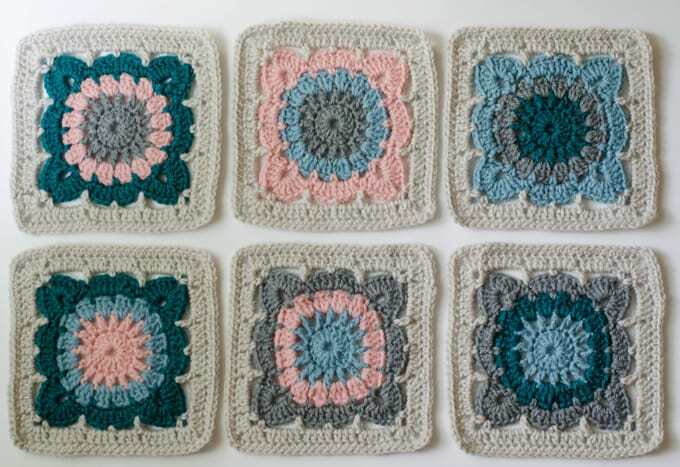 In the next installment, I will share the pattern for the afghan block I designed. I will also share the great story of how I came up with the name for this fun afghan! I’m so excited about it and hope you are too! Let me know if you like the afghan and if this planning afghan post was helpful! Cheryl, this article was extremely helpful. 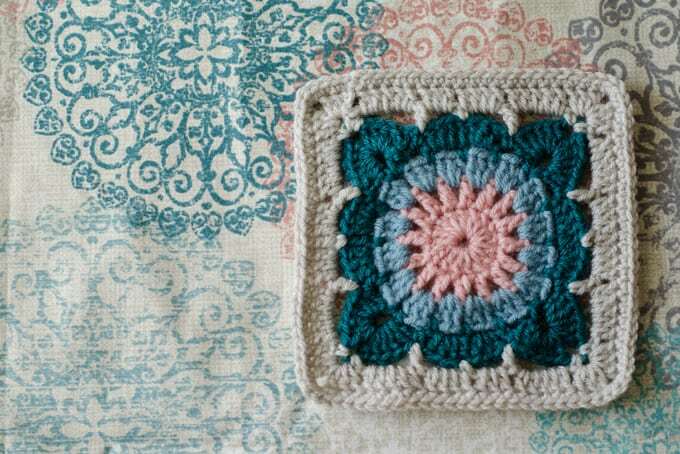 I want to crochet a granny square afghan (future project!) and your thought process is exactly what I needed. I love your square, also! I want to combine 2 or 3 different squares in my afghan, and your pattern is what I am looking for. I also liked the way you chose colors. Thank you for writing this! I look forward to the future posts about your Happily Ever Afghan. Thank you for the kind words! I’m so glad it was helpful! I’d love to see a photo of your afghan when you are done! I bet your sister will love it! Thanks for the sweet comment. I really want to make this beautiful Afghan for my recently engaged daughter!!! Can you please clarify the amount of yarn used. I read and reread but still feel like I missed something. I have 2 skeins each of Vanna’s Choice yarn in pink, silver grey and peacock. 1 skein of Sea Blue Hobby Lobby “I Love This Yarn”. This comes to 4 colors but I see you used 5. I’m sorry to bother you, I’m sure it’s right in front of me but for some reason I’m just not seeing it. You need about 35 ounces of the main color. 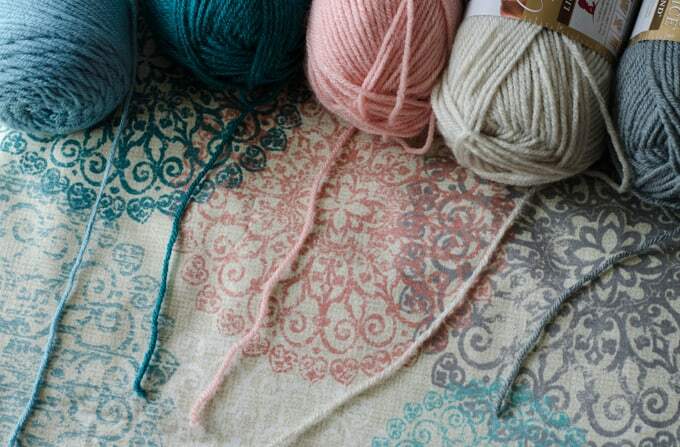 I used “Linen” color in Vanna’s Choice. I hope your daughter loves the afghan!